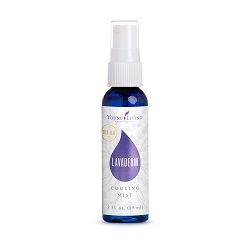 Promote healthy skin with LavaDerm™, Young Living’s refreshing Lavender spray. It’s made with skin-loving ingredients such as aloe, Lavender, Northern Lights Black Spruce, and Helichrysum to gently support healthy-looking skin. Its mild and gentle formula lightly moisturizes while also soothing and rejuvenating skin. Incorporate its refreshing feel and calming aroma into your nighttime routine or use it as needed throughout the day. The compact and convenient design of this skin moisturizer spray makes it easy to store wherever you need it, whether in your purse, travel bag, bedside table, or office desk. Spray topically onto desired area. Repeat every 10–15 minutes as needed.